In Kent and East Sussex there are thousands of acres of chestnut coppice (see featured and last image). That means fairly uniform sweet chestnut (Castanea sativa), where every 15 or 18 years the stems are all cut off to create poles mostly used for fencing materials. Chestnut is a hardwood and splits well. The cutting is done in sections (“cants”) and the corners of each section are often marked by leaving a stem which is cut at about 1.5 metres above ground level. 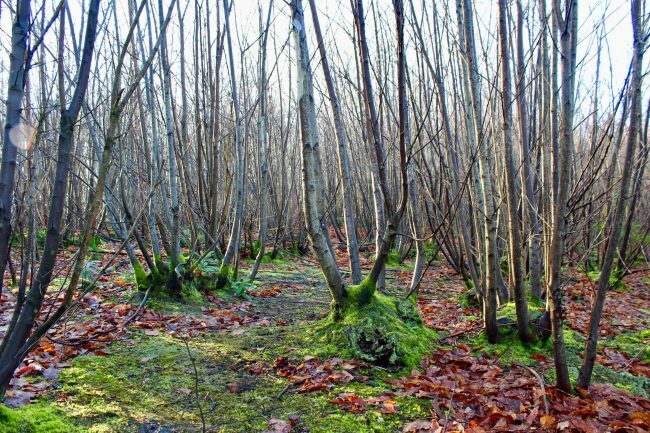 The great benefit of this sort of woodland is that it is very productive and the trees do not need replanting after felling - the coppice just sprouts back from the same roots or “plate”. Coppicing like this is an important part of rural life in South East England and goes back hundreds of years. It is thought that the Romans introduced sweet chestnut from Italy (probably for its nuts, rather than as a woodland tree *). As an 'introduced species', it has naturalised i.e. it propagates itself without further human intervention. 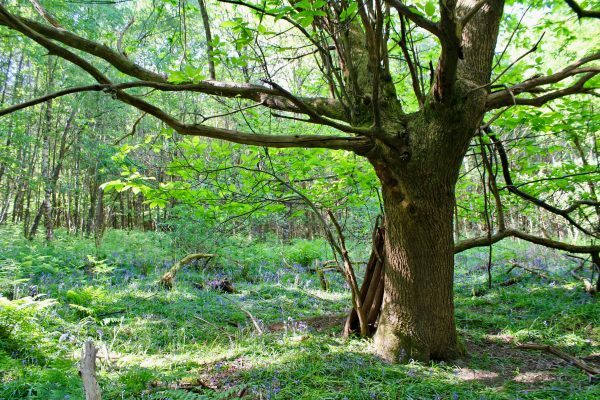 Chestnut coppice is often grown with Oak standards dotted throughout the chestnut crop which is very efficient - as chestnut can grow beneath them and this creates a woodland where chestnut can be taken every 15 years and oak every 100 years. So, short term need and long term capital growth are both catered for. However, the process is labour-intensive and it’s not obvious that there is enough demand for all the chestnut poles that can be produced from coppice and many areas of chestnut coppice are unmanaged and become overmature (or “overstood”). 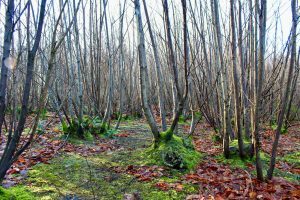 It certainly helps that many woodlands are now in private ownership where owners can coppice for their own use and not worry about the cost of labour - though coppicing is hard work! An alternative is “to single” the chestnut, so that you select a large central stem and leave that while cutting all the others. This central stem then uses the tree root to become a single large tree, which in due course will become a valuable tree. This process is sometimes called “storing” chestnut. Sometimes, the woodsman or woodswoman will need to go back to the singled tree after a few yers and cut the side shoots that grow as the plant tries to continue with its coppicing, but generally the singled stem will dominate and allow a much clearer forest floor to develop around it. 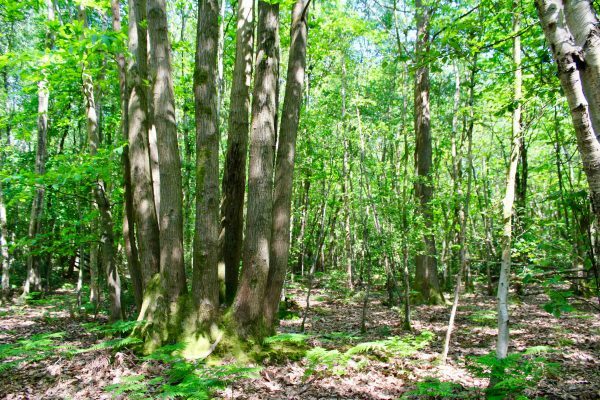 For the small woodland owner who wants more diversity and to be able to walk around in their woodland there is a strong case for some singling of chestnut coppice. Rackham, O 'Woodlands' (2006), Collins. 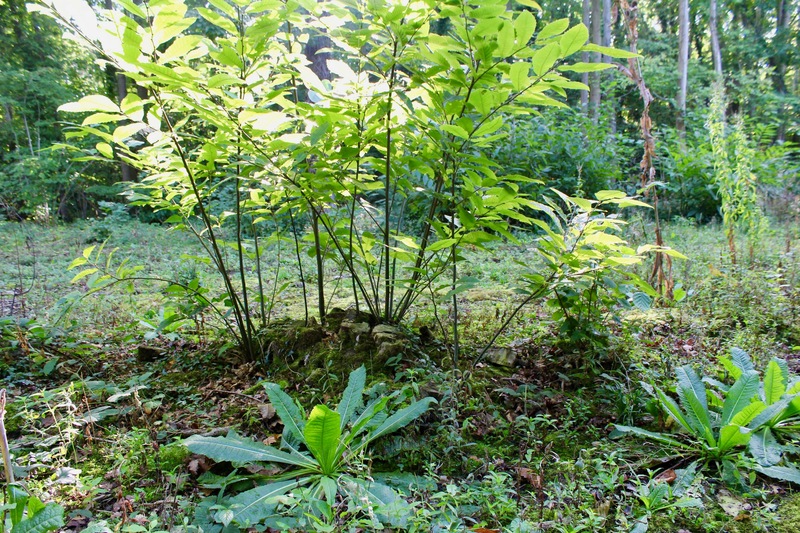 Thanks for this post on chestnut coppicing and singling. I have a lot of chestnut coppice in a mixed woodland, many of which are overstood. I invited my local forestry commission officer to visit my woodland and I was told that it was not safe to single which I believed would open the wood and add potential veteran trees. This article has allowed me to change my woodland management plan with confidence. Thanks for this great post! I’m learning about woodlands and really appreciate the time put into this.